May 12, 2017 update: We’re far behind on rainfall here in Central Florida, so the water level in many lakes is very low. It’s a good idea to call Middleton’s Fish camp (800-258-5002) and check on conditions at Blue Cypress Lake and whether rental boats / tours are available before you go down. Here are a few more photos from our trip to Blue Cypress Lake. Last week I only posted IR images, so this time I’ll use all color photos. It’s peaceful there. Whenever our boat was still, the calling Ospreys and Whistling Ducks seemed very loud. Occasionally we could also hear quiet voices from other boats carried across the water. Many of the Osprey nests are in smaller trees out in the water. The boats can maneuver for a good vantage point and standing up in the pontoon boats puts you almost at eye level with the wild birds – providing a wonderful view of their behaviors. Breakfast time – These chicks were very tiny. The third one (low in front) shows how well they blend in. Don told us that the younger chicks were probably from migratory birds, since they start nesting a bit later than the year round residents. In this next photo, two year round juvenile birds look almost ready to fledge. Mama and two juvenile Osprey. The Ospreys don’t have any trouble catching fish. But getting a photo of one with a fresh whole catch is a challenge. They almost always stop right away and consume the heads. And then deliver the rest back to the nest for their mate and chicks. I have more photos from Blue Cypress Lake in this album on Flickr. And Kevin K. has posted his from last Friday in this folder. I hope I’ve given you some sense of what a wonderful place this is. You owe it to yourself to go and experience it. Lone cypress at dawn (IR, B&W, panorama). The trees at Blue Cypress Lake are simply gorgeous. Their shapes remind me of Bonsai, although I think instead Bonsai should remind me of these trees. The ones here are all completely natural, formed by nature into elegant sculptures. I love the way my infrared camera renders them. The bright needles and clouds against the darker sky and water is very appealing. Lynn and I spent last Thursday night near Vero Beach and met Kevin K. at Middleton’s Fish Camp just before sunrise on Friday. Middleton’s is the only camp and the only development at all on Blue cypress Lake. The rest of the lake and shore is completely pristine and undisturbed – very rare in our state. It’s also quiet. And peaceful. And just stunning. Photographing Blue Cypress Lake (IR, B&W). I wrote about Blue Cypress Lake back in June of 2012, and that’s worth a read if you’re interested. All of the info there is still current. This place really is Florida unspoiled, and a photographic “target rich environment”. We went on one of their pontoon boat tours at first light and Don (our guide) was knowledgable and skilled at navigating in and among the trees near the shore. He mentioned that this lake and the surrounding swamp form the headwaters of the St. Johns River, which flows north to the ocean in Jacksonville – something I didn’t know. Lone cypress and Osprey (IR, B&W, panorama). 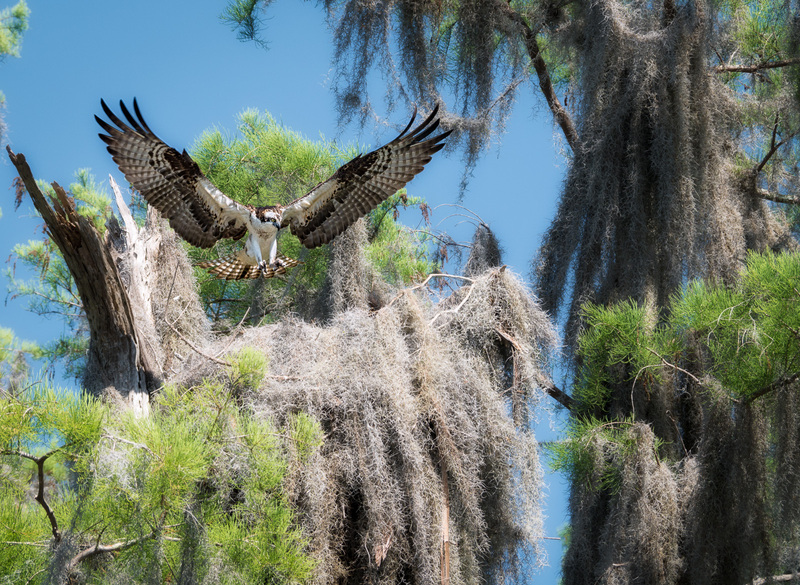 Blue Cypress Lake is also home to a large colony of Osprey. There are 200+ breeding pairs with eggs, hatchlings, and some almost fledged juveniles in nests in the Cypress trees. The birds fish in the surrounding swamp and carry their catch back for the young. Many of these Osprey are migratory and leave for South America after raising their young – something else I didn’t realize. Jeanne Middleton told me that prime nesting time starts around 10 April so we hit it just about right. I made a lot of photos of the Osprey last Friday too. I’ll finish processing them and post them soon. I should go down there and write about this place more often. It deserves to be seen, photographed, and saved for the future. Have you been? If not, what are you waiting for? Thanks for stopping by and reading my blog. Now – get some of your friends, head down to Blue Cypress Lake, and make some photos! Lynn and I drove over to the Suwannee River west of Gainesville, Florida last week and stayed for a couple of nights at Fanning Springs State Park in one of their cabins. Into the Suwannee River – The Manatee Springs run into the Suwannee. It turns out that April is peak season for Fireflies, at least around here. It’s been many years since we’ve seen any and it was a treat to watch them. On the second night, I set up my camera on a tripod and used the remote control app on my phone to make this photo from the mosquito free comfort of the screened porch at the cabin. Fireflies 2 – I used my Olympus E-M5 Mark II in Live Composite mode. This is an ~11 minutes total exposure, with ~330 frames at 2 sec, f/2.8, ISO 1600 each. Composited in camera. We saw other wildlife too, including lots of birds and a few Gulf Sturgeons jumping in Fanning Springs. I managed to catch this snake swimming through the high water at Manatee Springs with my iPhone. It’s a great time of year for a drive in Central Florida too. We enjoyed the beautiful wildflowers blooming along most of the roads. And the farms in the Ocala area along our route are both scenic and idyllic. Fanning Springs and Manatee Springs are about 7 miles apart along the Suwannee. Both offer kayaking, and swimming (usually), and many other activities. High water at Fanning closed the swimming when we were there, but Manatee was open. You can rent kayaks and canoes, and if you put in at Fanning, you can coast with the current down to Manatee. There’s a service that will return you back to your starting point. This sounds like a relaxing paddle to Lynn and I and we plan to try it next time. We’ll have to watch out for the jumping Sturgeons, though. There’s also a pontoon boat tour you can take from the concession at Manatee. Thanks for stopping by and reading my blog. Now – go enjoy some Florida State Parks and make some photos too! You may have noticed that I like Black and White photography. It’s how I started out, way back when (with Tri-X film, developed in a make-shift darkroom). So I’ve done it for a while, but I’m mostly self-taught. I’ve studied many books and looked at a lot of online info, but I felt it would be good to take a course and expose myself to techniques and ideas I haven’t discovered on my own – to see how others are doing it. I was a little worried at the first session. There were a couple of people who didn’t appear to meet the prerequisites and it seemed like we’d struggle trying to bring them up to speed. But they ended up dropping out and the remaining students all easily kept up with the agenda. Next week is our last class and we owe the instructor ten B&W images. I thought you might be interested in seeing some of the ones I’m going to turn in. The instructor’s going to critique our work and I’m looking forward to hearing what he has to say. This course has definitely lived up to my expectations. I learned several techniques in Photoshop – some that I’d heard about and never tried, and others that were completely new to me. I also enjoyed discussing printing techniques and I intend to apply these more in the future. I haven’t been printing my photographs as much recently as I should. The course was also a great incentive to think about and practice photography and especially B&W processing. You can see some other photographs I made for the course in this set on Flickr. Thanks for stopping by and reading my blog. Now – take a photography course – and go make some photos! Here are three photos I made at Orlando Wetlands Park last Thursday morning. My favorite program for converting images to black and white is the Nik Silver Efex Pro plug-in. I wanted to try a new one called “Tonality” by Macphun software. I processed these next two photos in both programs so I could compare results. Tonality is an exceptionally complete B&W conversion program with lots of presets and sliders to play with. It also has some built-in capabilities you might not expect such as layers, gradients, and selective edits. These come in handy when you want to combine several conversions without going through layers in Photoshop. Silver Efex Pro’s control points provide some of the same selective edit capability, but for me, the Tonality controls are more flexible. Tonality also has lens blur and glow simulations and the ability to blend in texture patterns. Lots of presets, options, and control! I noticed that the clarity control in Tonality sometimes resulted in halos that I has to tone down. But I found that overall I preferred the Tonality result over the Silver Efex version for these two photos. I don’t know if this will hold up long-term, since I’m pretty sure you can achieve very similar results with either one. I’m going to keep playing with it and see. By the way, Tonality is Mac only, Silver Efex runs on both Mac and PC. There are free trial versions you can download, so check them out yourself and see what you think. After the trip to Maine, I was looking forward to getting back out and photographing here in Florida. So it was up early (not as early as Cadillac Mountain!) and out the door to meet Tom M. at Orlando Wetlands before dawn last Saturday. Nature foiled our sunrise plans and instead served up some semisolid, soupy fog for our photo enjoyment. And we did enjoy it. It was interesting looking for compositions in the mist and trying to find foreground objects to add some definition to the photos. I like the one above but after looking at it on the computer, I wish I’d moved a bit to separate the near and far grass on the left. I didn’t see the overlap when I made the photo. It took a while for the sun to burn through the fog. That gave us time to try several different places. I thought the south shore of Lake Searcy and the southwest corner of cell 16A were very photogenic. I especially liked the light on the close leaves in this scene. Discovering beauty in unexpected places or situations is one of the addictive things about photography. Sunrises shouldn’t all be super saturated. New subject: The Lake Jesup flowers will begin blooming at the end of September. Here’s a link to my post about last year’s flowers, with much more info on them. Make your plans now! Florida’s blessed with many places where you can see Nature and / or animal life. There are captive animals in zoos / parks / attractions. There are anthropogenic places like Orlando Wetlands and Viera Wetlands, where human activities and management can greatly enhance opportunities for animals. And then there are places like Merritt Island National Wildlife Refuge and the Tosohatchee Wildlife Management Area (lets call it TWMA for short) where large areas with little human intervention can approach true wilderness. If you’ve driven the Beachline toll road (528) from Orlando to Cocoa, you’ve passed through TWMA. It’s spread out over 30,000 acres along 19 miles of the St. Johns River in east Orange County. It has a variety of natural communities including rivers / streams / lakes; freshwater marsh; Cypress swamps; Wet Flatwoods; Forested Wetlands; and Pine Flatwoods. Grassy Trail – In addition to dirt roads running throughout TWMA, there are lots of trails to walk or bike. Activities at TWMA include hunting, fishing, hiking, bicycle riding, horseback riding, canoeing and kayaking, camping, and scenic driving. There’s a daily entry fee and hours are 8am to sunset. As long as it hasn’t rained too much, the dirt roads are passable – even with a two-wheel drive car. So everyone can see much of the area. Hiking trails lead off from parking areas on the roads so you can get even further out into the wilderness. eBird lists 162 species seen in TWMA, vs. 293 in Merritt Island National Wildlife Refuge, so there aren’t as many kinds of birds there. And they’re spread out over a larger area, making them harder to see. During my visit, I found Great Egrets, Snowy Egrets, Tri-colored Herons, Great Blue Herons, Little Blue Herons, Osprey, Yellow Rumped Warblers, Palm Warblers, Red-winged Black Birds, Anhingas, Belted Kingfishers, Red-shouldered Hawks, an American Kestrel, Black Vultures, an Armadillo, and a deer. I hadn’t explored TWMA until recently. I’m glad I finally got down there. Although you may not see as many animals as you do in some other spots, the types of terrain are more varied and the animals are there if you’re patient. It’s a great place to catch a hint of wild Florida out along the St. Johns River. Definitely worth a visit! TWMA is about 25 miles east of Orlando, near Christmas. From Orlando, take S.R. 50 east to Taylor Creek Road. Turn south on Taylor Creek Road and the entrance will be on the east. You can click on the photos above to get to larger versions on Flickr, and this set has a few more images from Tosohatchee.